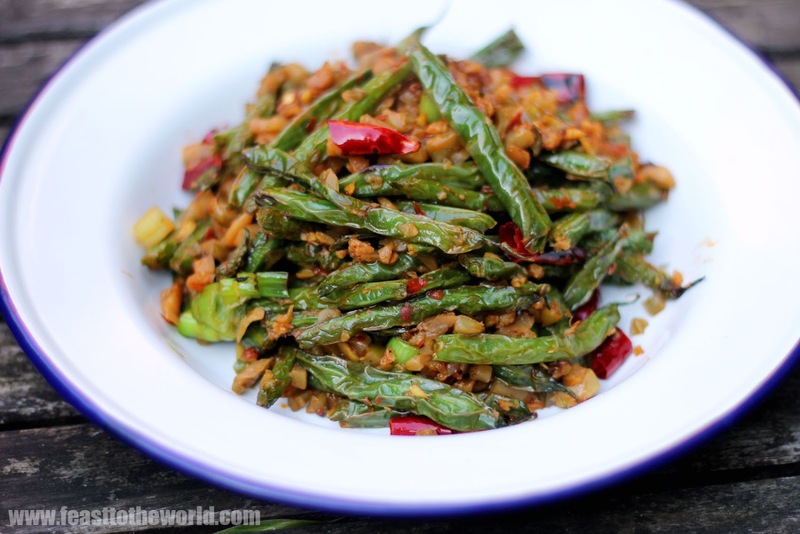 Another famous Szechuan(Sichuan) classic dish. Like the Gong Bao chicken and Fish Fragrant aubergine before it, this frequently appears on my twitter timeline and is a dish beloved by all it would seemed. With all these delicious looking images cropping up on my screen, it's only a matter of time before I finally succumbed to my inner cravings. And so, I decided to cook this tasty classic for a quick supper recently. Dry-frying is a popular technique of cooking in Szechuan cuisine. The beans are first stir-fried in a dry work slowly until cooked which gives them their signature 'wrinkle' look and a smoky aroma before cooking in a savoury sauce. These days, it is more commonly deep fried in oil to achieve the same effect while saving time. I have eaten many versions of this dish. 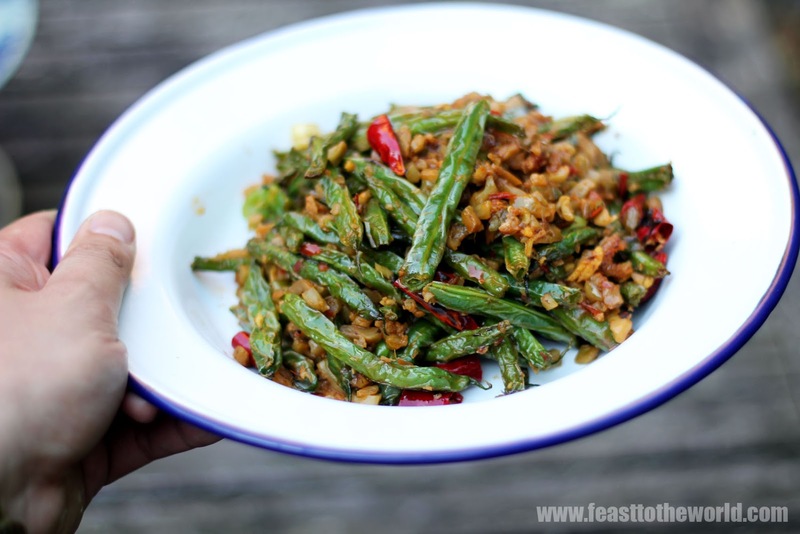 Some with minced pork and some without; there's the inclusion of dry chillies in some; and then there are those with Tianjing yacai (a famous Sichuan preserved vegetable) etc. Here is a version that I grew up with. My mum uses dried shrimps and Fuling zhacai (preserved mustard), my absolute favourite of all the varieties of Szechuan preserved vegetables. I love this dish so much I can eat copious amount without ever being tired of it. And just so you know, despite being intended to serve two to four people in the following recipe, I ate it all by myself. That just show you how good this is. Soak the shrimps in hot water for 15 minutes. Drain and finely chopped. Reserve the soaking liquid. Rinse the preserved vegetables with plenty of running water. Drain and finely chopped. Fill the wok with enough oil and heat to 180ºC. Test by dropping a small piece of stale bread, it should sizzle and browns in 30 seconds. 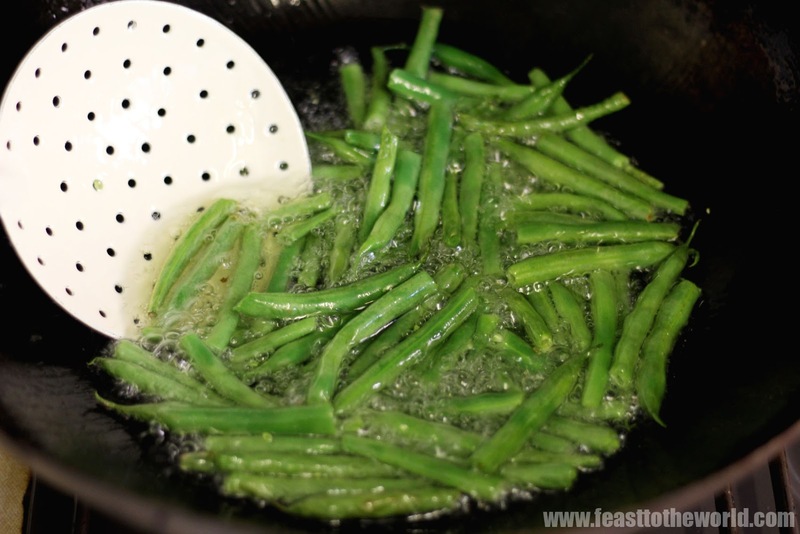 Fry the green beans in batches, taking care not to overcrowd the wok, for 4-5 minutes, until they wrinkle. Remove and drain on kitchen paper. 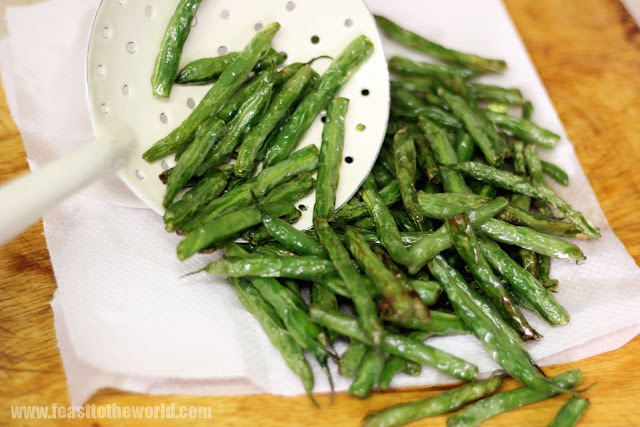 Repeat with the rest of the green beans. Pour away all but 2 tablespoons of oil and return the wok back to the heat. Turn up the heat to high and when smoking, add the garlic, ginger and stir-fry for 30 seconds, until fragrant. Add the shrimps and chopped preserved vegetable and cook for 1 minute before adding the soy sauce, chilli bean paste, sugar and 3 tablespoon of the reserved soaking liquid. Return the beans to the wok and stir-fry for 2-3 minutes, until most of the liquid have been absorbed and the beans are thoroughly coated with the sauce. Add the sesame oil,spring onion and season with salt to taste. Give everything in the work a final toss to combine before removing from the heat. Serve with some steamed rice. 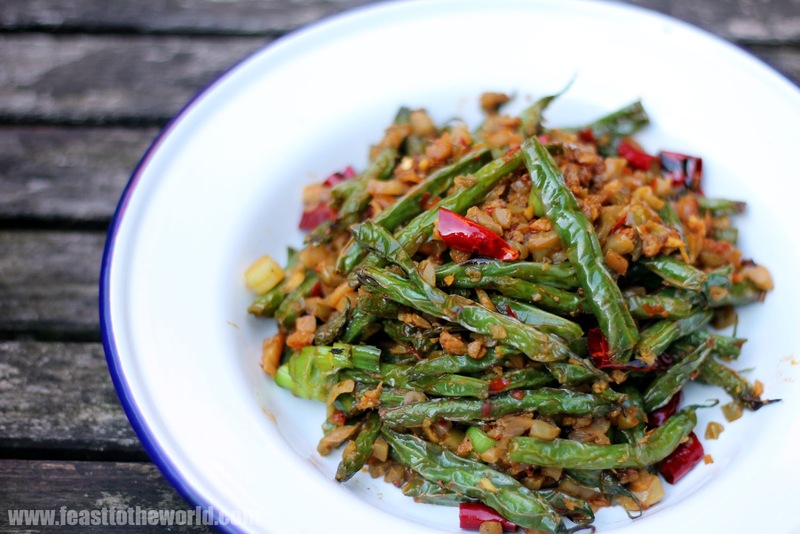 I love this dish - I often eat it at home with rice and a fried egg on top!